A guiro, also sometimes called a “fish” is an instrument from Latin American that makes noise when a stick or a rasp is pulled over a series of ridges. Originally, guiros were made from natural objects such as bones or dried gourds that had ridges carved into them with knives. Later they were made from wood and metal as well. To make an easy version of a guiro, all you need are recycled water bottles, materials for decoration and filling and simple scrapers. Recycled water bottles with ridges (like Poland Springs) make excellent homemade guiros. You can use sharpies or stickers for decorating the outside and any materials such as beads, seeds, glitter, salt, pebbles or unpopped popcorn for filling up the inside. 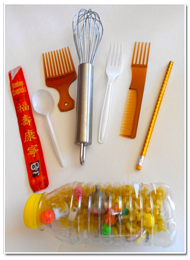 Use unsharpened pencils, chopsticks and egg whisks or hair picks for your guiro scrapers. Collect bottles with ridges in advance. Take the wrappers off and decorate the outside if your like or leave it clear. It helps to mark each child’s name on the bottom with a permanent marker. Then fill them with something that rattles and add a bit of glitter or confetti for fun, if you like. Put the cap back on your bottles and seal with electrical tape to keeps the contents in. If you like, add colorful ribbons to the top part. When you are ready to play, give each child an unsharpened pencil or chop stick to rub on their guiro. Demonstrate the sound that a guiro will make when rubbing it. You can play it along with a simple song like La Cucaracha (The Little Cockroach), a fun song with Spanish and English lyrics. Next, play a song with a Latin American rhythm and let the children play along. Ask them to listen to the song and see if they can make their instrument fit in with the beat. You can choose fast and slow songs so the children can try different beats and rhythms to play along with. 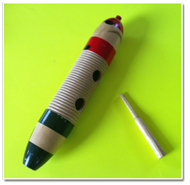 For younger children or kids with differing abilities, they can also use their guiro as a rattle or shaker and play along with the songs you’ve chosen. Since the guiro is from Latin America, you may wish to try a simple counting song in English and Spanish. Each time a number is said, the guiro is scraped downward. He gets his friends and moves away!